Blackstone River Theatre will offer a 4-week session of classes in Bodhran (the Irish drum) on Sundays, 10-10:50 a.m. (continuing beginner level) and 11-11:50 a.m (also continuing beginner level) on April 14 and 28, and May 12 and 26. These classes are geared towards adults and teens. A minimum of 6 students is needed to hold class with a maximum of 9 students. The fee for the 4-week session is $ 65.00 and prepayment is necessary. Students must have their own bodhran and tipper. NOTE: Exact class placement will be made by Kyle as registration comes in so he can place "like levels" of continuing beginner students in the same class. The bodhran is a small handheld Irish frame drum consisting of a goatskin playing surface stretched over a wooden frame. The drum can be struck with the hand, "finger style," but most Celtic percussionists strike the drum with a double-headed knobbed stick known as a tipper. This Bodhran class will cover the most common rhythms used in Irish traditional music – reels, jigs, hornpipes, polkas, etc – as well as a variety of ways to adapt them with ornamentation, tonal variation, and syncopation. The goal is to create versatile and sensitive players who are able to accompany in whatever style they prefer, be it traditional or more modern. 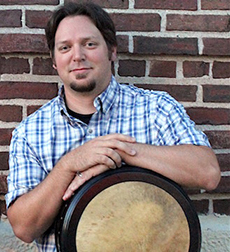 Kyle Forsthoff has been studying and playing Irish percussion for over ten years. He performs with Fellswater and has also shared the stage with artists including The Vox Hunters, Lindsay Straw, Torrin Ryan, and Joey Abarta. Forsthoff competed in the Fleadh Cheoil na hEireann in Sligo, Ireland in 2015 and also attended the 2014 Craiceann Bodhran Summerschool in Inis Oirr, Co. Galway.